This haul marks 11 new additions (including two unlicensed) to my NES collection and the first time since beginning the NES Quest that I’ve encountered a particularly rare game– Panic Restaurant, in the wild. And although I wasn’t able to acquire the game, even being able to see it in person provided a nice jolt of excitement in my NES collecting. Earlier this year in September, I had been out picking at garage sales for hours and was getting ready to head home with only about $25 in pocket, when I stopped at the final garage sale of the day. The first thing I found were some retro NES, Sega Genesis and Super Nintendo games all just a little under market value. The yard sale was run by some middle-aged folks, but the table with the games seemed to be operated by a guy in his late teens or early 20s. There were only a few NES games on the table– all commons. So I decided to ask the seller if he had any more NES games that he might be willing to sell. I told him I was going after a complete NES collection and, we instantly struck up a conversation about Nintendo collecting. He was a bit of a collector himself, so we talked about our mutual passion for retro games for about 20 to 30 minutes. We both expressed being fans of Angry Video Game Nerd, who was partially responsible for rekindling many people’s interest in retro gaming culture. He had just attended a retro-themed convention, where he met James Rolfe (AVGN) and got him to sign a copy of Top Gun. I thought that was awesome, although I would have gotten him to sign a copy of Dr Jekyll and Mr Hyde or a Mr. Bucket toy. I showed him my trusty Google Drive spreadsheet with my NES collection, which was at about 140. He mentioned that he might be able to help me out on the NES Quest. He said that he wasn’t specifically collecting NES games and that he really was just collecting titles from some of his favorite series spanning every Nintendo console. He had a few more common NES games inside that he might be willing to trade, including one rare one. I got excited at the idea of finding a rare NES, even though I figured I’d walk away without it since I only had about $25 on me. 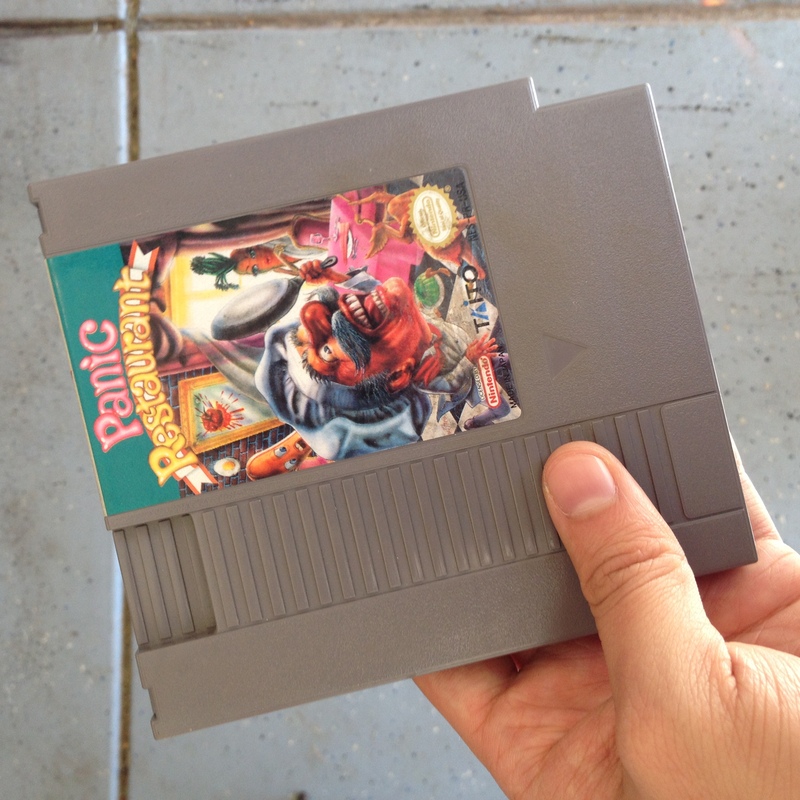 The game was Panic Restaurant, which was the first time I had ever seen it. Last I had checked, it was worth about $150, but it had gone up considerably since then. He didn’t seem interested in parting with it. And since I didn’t have enough cash to make him a reasonable offer, I didn’t inquire. I did, however, snap a picture as a memento of the experience (pictured below). He did pull out a stack of a little more than 25 cartridges. I separated the games to find the ones that I needed and made him an offer– $25 for 11 games. 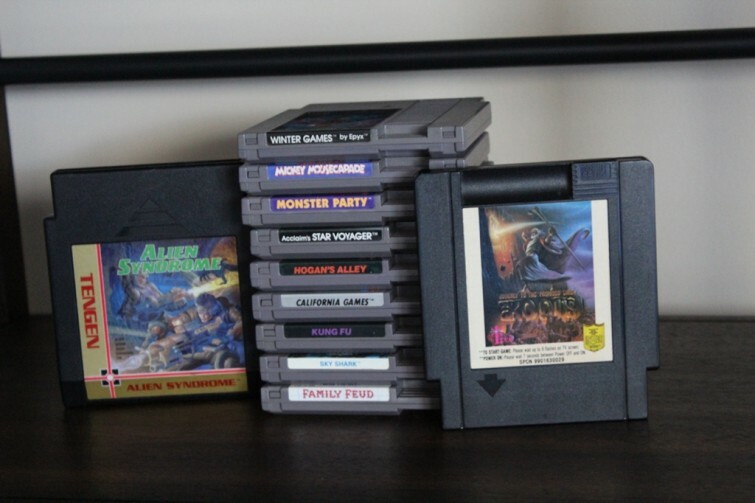 The games that I was able to pick up include: Winter Games, Monster Party, Mickey Mousecapade, Star Voyager, Hogan’s Alley, California Games, Kung Fu, Sky Shark, Family Fued, Exodus and Alien Syndrome. Even though I wasn’t able to bring Panic Restaurant home, it was a really positive experience just to be able to stop and spend some time chatting in person with another retro gaming enthusiast. This haul brings my collection from 145 to 156 loose NES games (including nine licensed titles and two unlicensed). 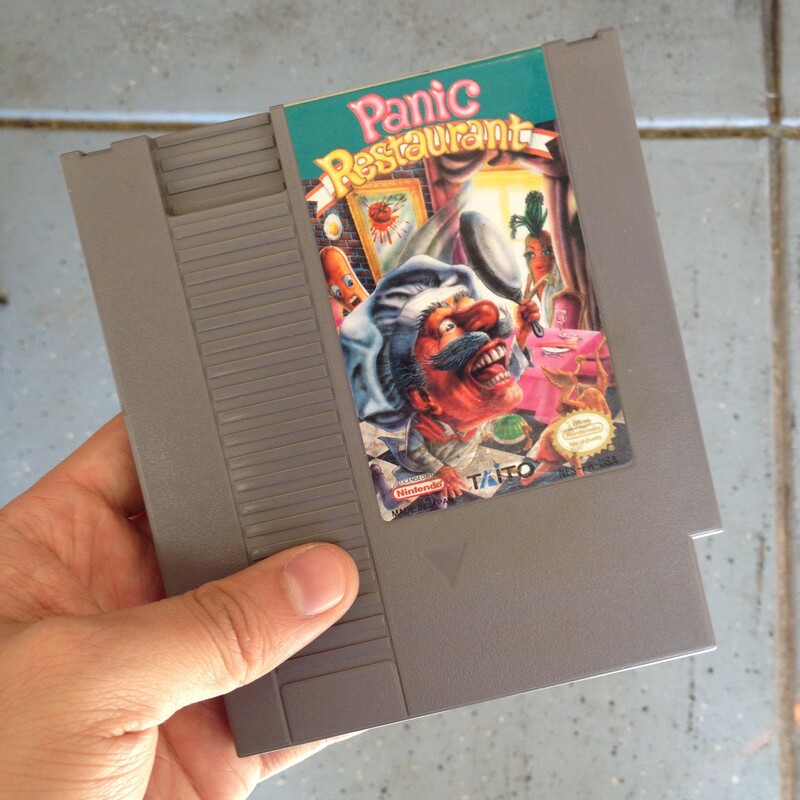 For the rest of the entries of NES Quest, check them out right here on Retro Chronicle.